I’ve written before about the incredible hope that gardens represent. Where you plant tender babies and expose them to heat and cold and a million ravenous critters and still believe with all your heart that those grasses that reseeded themselves prolifically last year in the hellish August sun will be overrun by tomato plants and peppers bearing heavily. This photo represents the realization of hope. 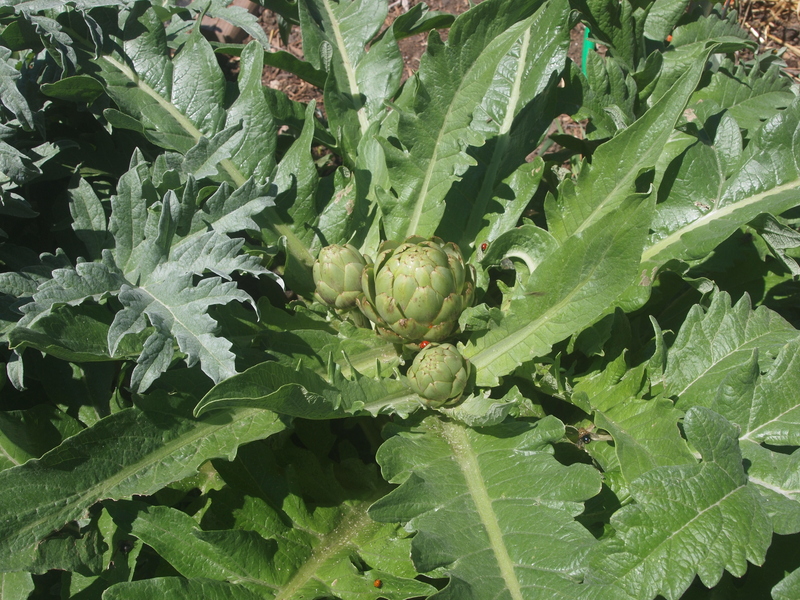 Artichokes love cool weather and water and loads of compost. I had none of that last year and consequently no artichoke buds either. However, I bundled them up through the winter we didn’t really have and now in the Spring they are rewarding me. . . with something. Not in great profusion but still. . . They also provided a haven for ladybugs, who have turned a million ravenous aphids into hollow corpses. Woo-hoo!!! I have six artichoke plants, now all starting to bud out. So, there you have it. Artichokes in South Texas. Now if I can only stop the stink bugs from covering them as well, I’ll be a happy gardener. Oh. And I’m hoping that I managed to protect the butternut squash from squash borers. I’ll let you know about those nasty destroyers of hope but you see how it works? I had squash borers last year and the year before that and they destroyed my squash plants right when they were at their most beautiful. Hope. Insidious Hope. What would we do without it?